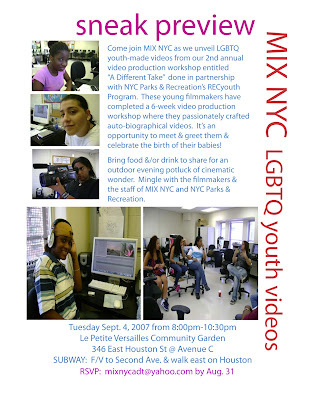 MIX NYC’s “A Different Take”- Sept.4 | Allied Productions, Inc.
celebrate the birth of their babies! Subways: F or V to 2nd Ave. and walk east on Houston St.
Visit www.mixnyc.org for further details. Citizens for NYC, Green Thumb/NYC Dept. of Parks, Materials for the Arts. Film events are made possible with support from New York State Council on the Arts, a state agency.